The Stock Control Module controls movement between as many stockrooms or locations as your business requires. Information on usage is provided, for every item, along with ABC analysis. 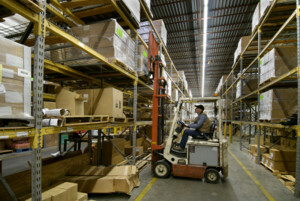 Stock can be recorded in multiple rack / bin locations for each stockroom. 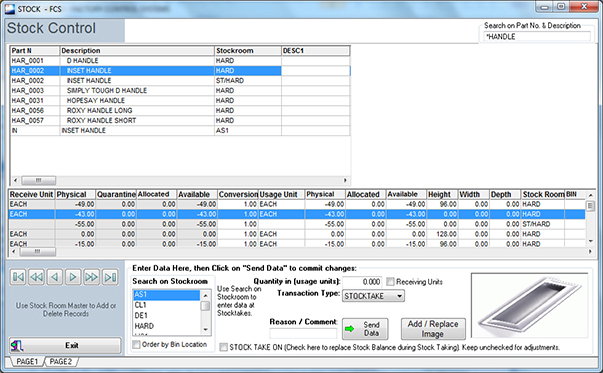 Stock re-order points can be automatically controlled, using minimum and maximum stock level parameters. Information on current stock levels includes: physical, allocated, quarantined and available stock, routinely viewed on screen, or printed to hard copy. Option to set purchased product on a daily, weekly or monthly basis, for efficient purchasing and cash allocation. Data can be viewed as: Used this Week, Used this Month, Used this Year, Used Last Year data. Stock Movements and Periodic Inventory Checks can be booked through the keyboard or by using a barcode and scanner (portable and fixed). Minimum stock levels and EOQ (Economic Order Quantity) can be set for each item, to ensure internal and external orders are ordered in acceptable batch sizes. Stocktaking sheets are organised for easy stocktakes and booking, to ensure stocktakes are complete, accurate and efficient. Option to set the type of ordering by item. This can be: Make to Order with Tracking, Grouped Make to Order or Make to Stock. Option to set items to 'buy to order' policy, for back to back purchasing, keeping customer order details for easy tracking. Stock reports are sorted and printed by item code and description. Stock levels are highlighted as: low, high or okay, according to minimum levels and resource requirements, along with the various ‘flags’ and usages set against the item. Stock can be adjusted, transferred or quarantined, recording the user / date and time of each movement. This can be done through menus, or barcode scanners with keypads. Stock valuation reports are summarised at standard or current costs by stockroom, with an accompanying total for all stockrooms.